Capture Crew are making a film of this ride. Send us your song suggestions for the soundtrack and everyone will vote on the day of the ride. 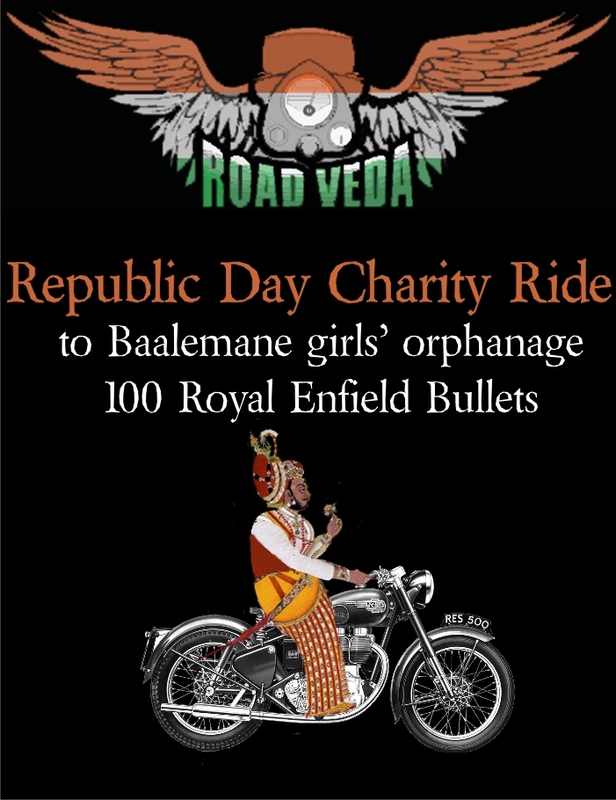 Road Veda is organising a charity ride for a girls’ orphanage on Sunday January 31st. This ride will give you a chance to improve a girl’s life, by applying your mind and heart to her cause. Donations are welcome in kind (and can be selected from the list given below) – they will go a long way to making this orphanage a more livable space. There is no minimum and certainly no maximum. From a single spoon to a whole wardrobe, anything that will help us improve how the girls live is very welcome. Please note that the amount listed beside each item is the total number required; you may want to give two of the 50 light bulbs needed or one mattress from the 12 on the list. Riders can also give specific cash amounts for particular expenses – such as a month’s vegetable supply – as listed below the ‘donations in kind’ list. It will be a fun ride of almost 100kms outbound, through big highways, narrow country lanes and well paved and winding state highways. The return journey will be just 30kms, to Opus where beers and mojitos flow freely and a sumptuous brunch awaits us. Once an item has been selected by a rider or group it will be marked as such on the list so we don’t end up with 500 plates and no mattresses…. All gifts/donations can be handed over to the Road Veda truck which will come to fetch them at a time and place convenient to you or dropped off on 29th Jan as above in red. All contributions in cash will be exempt from income tax up to 50% of the value of the donation or as specified in the IT act, section 80G. The aim is to get 100 bikes, both Royal Enfields and other classic bikes. Please do join us. Fastrack has stepped in to help us spread the word! My suggestion for the tune: Dancing with Kadafi, Infected Mushroom….it is a tune that has a proper journey. A wholesome day out making giving a whole load of fun. Enjoy bulleteers with love from chilly england.